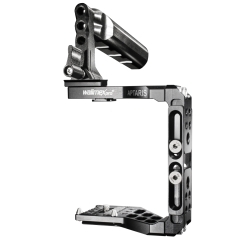 With the walimex pro Aptaris Canon C100/300 Pro set you not only can extend your Cage to a Rig with just a few flicks of your wrist, your also supplied with a extensive range of accessories for varies purposes of use. An extensive set for highly professional shooting sessions with the Canon C100/300. 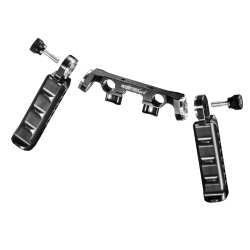 The set includes the height adjustable Aptaris Universal XL Cage system incl. XXL adapter and threaded adapter from 1/4 inch to 3/8 inch to match the Canon C100/300, as well as the Aptaris rod, handle and shoulder module for converting your Cage to a Rig. Innovative accessories like 2 booms, a monitor plate and a battery plate complete the professional outfit. Due to the extremely high flexibility and operability, the set is suitable for a vast amount of different applications. 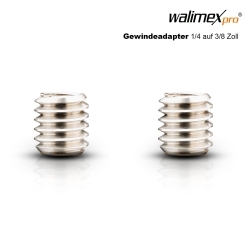 All components of the Set were developed and manufactured in Germany and impress with highest precision in workmanship. Materials used are light aircraft aluminium and stainless steel – for extreme longevity and robustness. walimex pro Aptaris Universal XL matches all common cameras, such as e.g. Panasonic GH-3, Nikon D800, Canon 5D Mark III. Thanks to the XXL adapter, which is also part of the delivery, Aptaris Universal XL also fits larger cameras, like the Canon C100/300. The delivery includes another threaded adapter from 1/4 inch to 3/8 inch, so that Aptaris can be mounted to the camera via the hot shoes of the camera and the camera screw fastening. 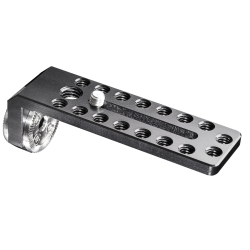 The adjustability of the cage in height via four Allen screws is an absolute highlight. This makes the version suitable for a vast range of cameras. Two small hooks on the camera mount, which can be individually adapted to the camera, ensure absolutely skid-free mounting. Due to its vast number of 1/4 inch threads on all sides as well as a 3/8 inch thread on the bottom side, a vast amount of accessories, like microphones or LED-lights, can be mounted, just as desired. The adjustable handle, which can be mounted at the top, the bottom or at the sides, just as required, provides additional flexibility in use. This enables also filming near ground level. Due to an adapter plate with Manfrotto PL 501 standard, you can also mount Aptaris on a Manfrotto tripod. Access to battery compartment, memory card etc. is in any case ensured. 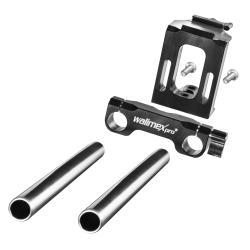 For even higher flexibility walimex pro offers a rod module for the innovative walimex pro Aptaris cage system. 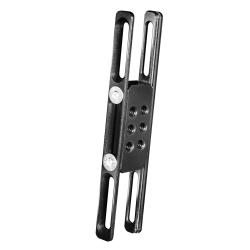 The rod module is simply mounted to the main unit by means of an innovative quick-action lock solution. For professional results you can attach further accessories, like e.g. Follow Focus or a Matte box to shield off sun light, to the 15 mm Ø rods. The rod module also offers highest flexibility in use: It is adjustable in height and, with a thread on the bottom side, it can be mounted on a tripod or a quick-release plate. 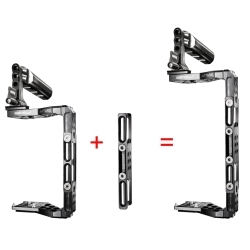 The Aptaris handle module not only extends your Aptaris Cage, but can also be combined with numerous common rigs. The module is thereby simply mounted to the rods of the rig. Due to their ergonomic design, the handles feel particularly comfortable in your hand. 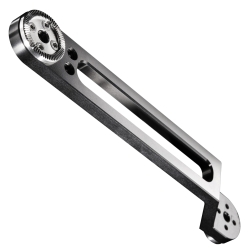 Suitable for rods with a 15 mm diameter (industrial standard). 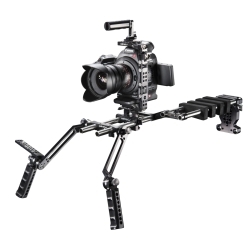 The Aptaris shoulder module not only extends your Aptaris Cage, but can also be combined with a vast number of common rigs. The module is thereby simply mounted to the rods of the rig. 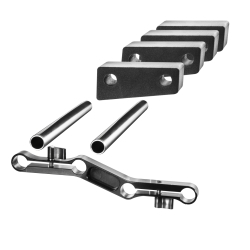 Suitable for rods with a 15 mm diameter (industrial standard). The shoulder module can be individually adapted. Soft shoulder pads additionally ensure highest carrying comfort in any situation. 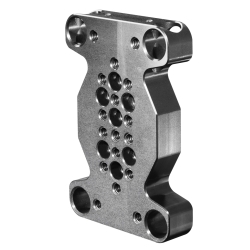 The shoulder module is suitable for the left and right shoulder.